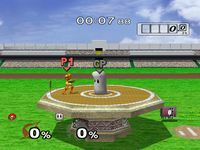 The Super Smash Bros. Melee version of Home-Run Contest. The Home-Run Contest is a 1-player stadium challenge in Super Smash Bros. Melee, Super Smash Bros. Brawl and Super Smash Bros. for Nintendo 3DS / Wii U. The object of the contest is to hit the Sandbag as far as possible. The player gets a Home-Run Bat to do this, but also can use other methods of hitting the Sandbag within the ten-second time limit. In Super Smash Bros. Melee, if the player manages to hit it over 1,325 feet (400 meters), the N64 Yoshi's Island stage can be unlocked. This is best to do with Yoshi, as the name of the stage implies. By getting over 450 meters, the Paper Mario trophy can be won. In Super Smash Bros. Brawl, the game can be played the same way as before. The player smashes Sandbag to inflict damage on it, and then they use the Home-Run Bat to knock Sandbag as far as they can. However, there are a few differences from the Melee version and the Brawl version. In Brawl, the platform is protected by a shield, which will stop Sandbag from falling off when the player attacks it. This allows players to attack the Sandbag even more without having to worry over it falling off, thus, resulting in a Game Over. This increases the amount of combo moves that can be used as well. However, the barrier can be broken if Sandbag hits it too many times, or if the player hits Sandbag with the Home-Run Bat or a powerful attack. When time is up, the barrier disappears and the player can smash Sandbag. Another difference, is that it supports multiplayer play. Players can either work as a team to damage Sandbag as much as possible, or compete against each other in alternating turns. This mode is also supported with Wi-Fi Connection, using the With Friends mode. In Wi-Fi mode, both cooperative play and alternating play can be played. The contest returned once again in the 3DS and Wii U edition with a four-player VS. option. 3DS: "You've got 10 seconds to attack Sandbag and raise its damage. Grab the bat before time runs out, and hit Sandbag with a smash attack to send it flying! The higher Sandbag's damage is, the farther it'll fly. Swing hard and aim for the stands!" Wii U: "You have 10 seconds to build up as much damage as possible. Grab the bat before time runs out, and use a smash attack to send Sandbag flying! The higher the damage dealt, the farther Sandbag flies. Send it sailing!" This page was last edited on October 2, 2018, at 15:47.